Meryl Streep. Anne Hathaway. Emily Blunt. Stanley Tucci. Simon Baker. Adrian Grenier. Comedy. Media/Journalism. Women on Film. 01 Mel's Must Sees. Oscar (Best Female Lead). Chick Flicks. 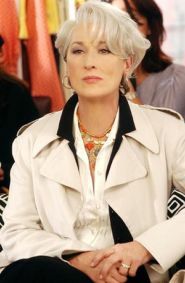 Andy Sachs has landed a job that most of those interested in such things would kill for, she's the assistant to legendary (and legendarily tyrannical) New York fashion editor Miranda Priestly; but as Andy struggles to keep pace with the outrageous demands of her boss she's in danger of losing sight of what's really important to her. "The Devil Wears Prada" is a comedy very much in the same vein as the Bridget Jones franchise so anyone expecting satire will be sorely disappointed, though it is pepped up considerably by some crackingly OTT performances from Meryl Streep and Stanley Tucci.